Dodge’s new Officer Protection Package is specifically designed to keep officers from being ambushed from behind when sitting in a parked squad vehicle. The company is repurposing existing technology in its Dodge Charger Pursuit police cars that enables rear-facing ultrasonic parking sensors to be activated by flicking on the protection feature. Essentially, the sensors can be tripped by something as simple as movement behind the vehicle, which activates the rear camera, triggers an alert chime, and automatically rolls up the front windows and locks the doors. It may not seem like a major advancement, but the fact that it only requires a small box to be plugged into the OBD II port to take advantage of existing technology in the vehicle helps offers peace of mind to officers utilizing Dodge squad cars. 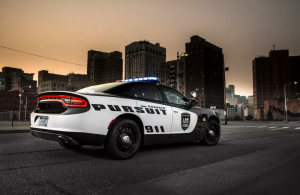 According to Dodge, every 2017 Pursuit Charger will come standard with the technology.